I always get asked if I prefer Hong Kong to Singapore, and that's always a particularly hard question to answer because i’m pretty sure i’ve yet to explore every nook and cranny that Singapore has to offer. I’ve lived in Hong Kong for 18 years and Im still discovering new places to explore and hang out. So I thought I’d share a couple of places of both beauty and miscellaneous over time within our travel section of our blog. 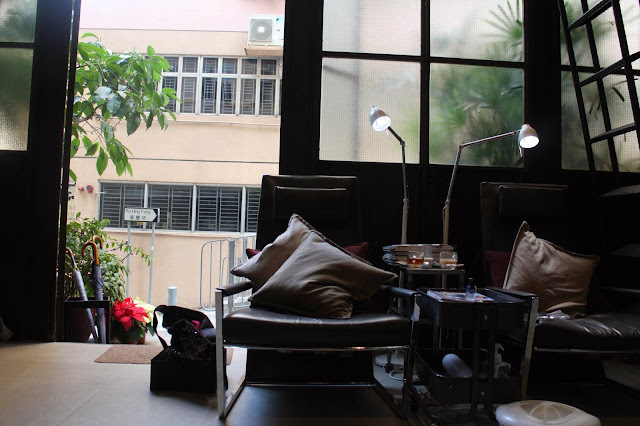 Here's a really cool beauty spot in Sheung Wan (Hong Kong Side) that One of my best friends, Ting and I ventured to the other day - The Nail Library. I first heard about them on sassy.com and seeing that both Ting and I absolutely love the whole new york-loft get up, I figured this would be a nice place to take her as a little christmas treat! You won't miss the lovely doors that open up to this lovely nail salon, its absolutely beautiful it is own way. There:s something about the large panel doors down to the building number displayed at they top that I love so much. 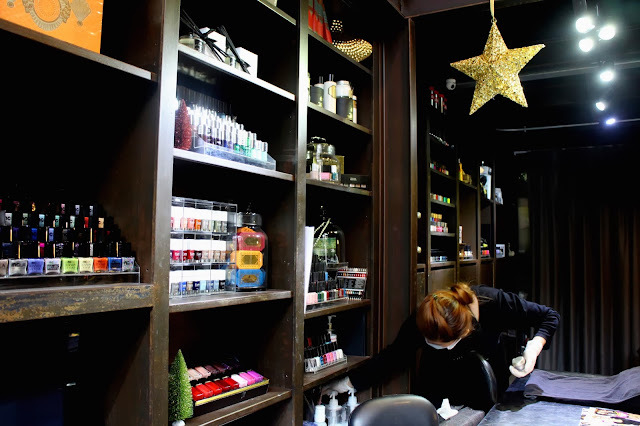 You walk in and you'll see the display of nail polishes to your right, a VIP section above and the nail stations right before you.
" Inspired by the New York urban lifestyle, The Nail Library is the first and only premium, hand, foot and nail experience in Hong Kong. 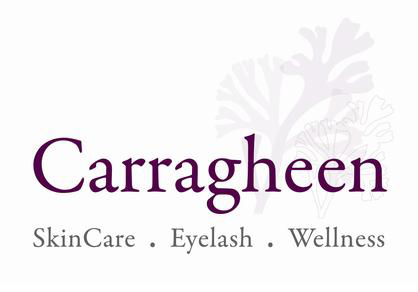 Offering a full range of treatments from signature manicures and pedicures, to theultimate pampering experience, The Nail Library is the perfect place to go for a relaxing and indulging experience. 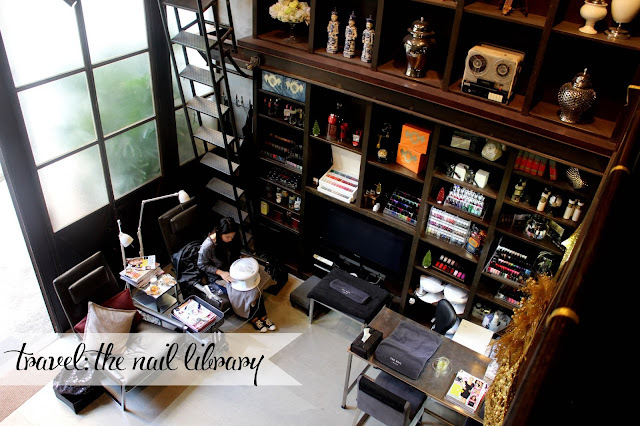 Boasting Hong Kong's largest range of nail lacquer brands and colours, The Nail Library has a colour for everyone. " 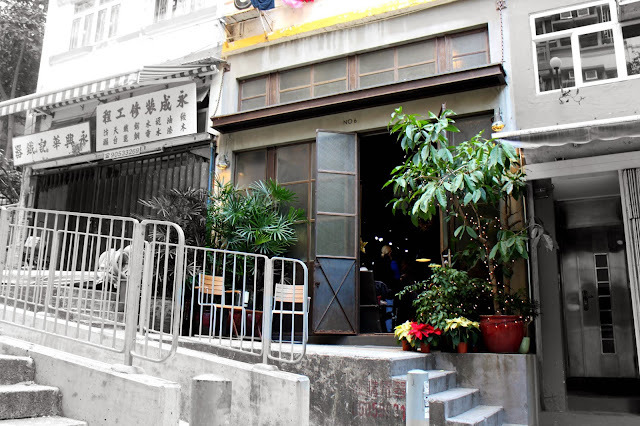 What’s great about anything thats located in Sheung Wan is that it’s not quite in the heart of Hong Kong, but a decent walking distance away from the bustling streets of central. 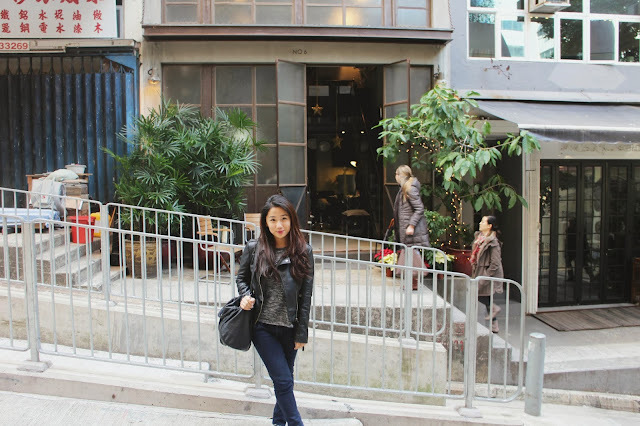 I absolutely adore the atmosphere in Sheung Wan, I'd love to live here one day, its so quiet and there are so many quirky concept stores and tasty eateries around here. Definitely my kind of place to hang out, so yes... do expect maybe one or two posts from here over time! They had an amazing selection of nail polishes to choose from, Deborah Lipman, Chanel , Juelp, Zoya, OPI, Butter london, and even the new Marc Jacob nail polishes! I was in awe at the selection that they had and It definitely took us awhile before we could arrive at a decision. One of the manicurists, Hebe, mentioned that their boss loves to travel and brings in all the latest nail polishes to the salon. So if you're looking for a newly launched collection / a brand that's not sold in Hong Kong (i.e. NCLA) , you're most likely to find it here. 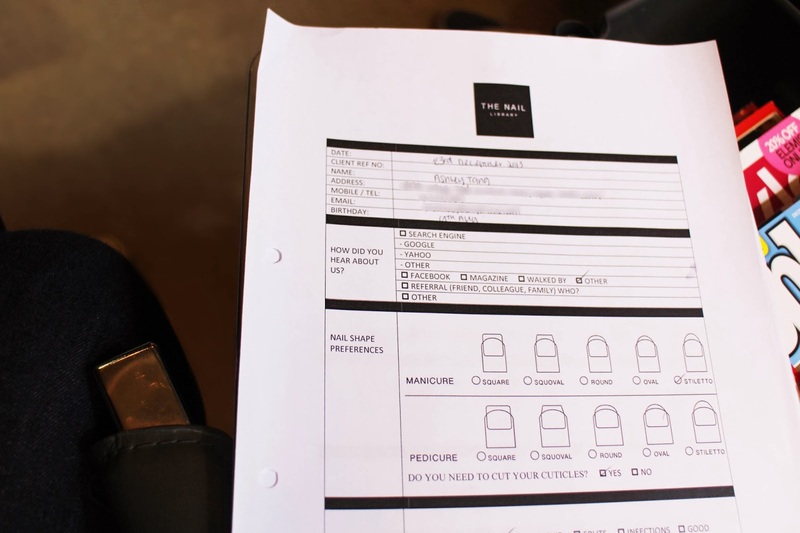 We were asked to fill out a simple form that indicated our nail concerns, ideal nail shape and some personal details. I’ve not really had any nail salons do this and its a great addition to show that the nail salon does cater to suit your needs. In case you were wondering, I initially wanted stiletto shaped nails , but I opted for square nails in the end as I had work a couple days later and wasn't sure if it was going to get in the way. Then we began the process of a basic manicure, exfoliation of hand and finally a fresh coat of polish for us! Ting & I have been talking about getting manicure for a long time, but with our busy schedules it was hard to find a mutual free time to do so. 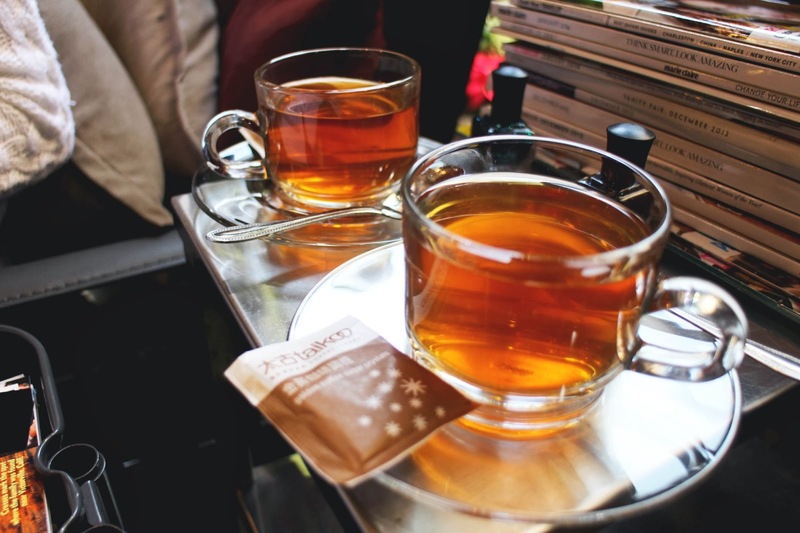 Even if there was an opening, we’d usually spend our time shopping or sailing at sea. So here's a look at our nail polish colours that we picked out! I decided to switch things up for the new year and step out of my comfort zone of nudes, taupes, blues and teals and venture into something different. A holographic wash of NCLA’s “ Vacation on Mars” from their holographic collection. Ting went for something festive with the beautiful specs of glitter in Deborah lip man’s Across the Universe. I didn't manage to get a snap shot of Ting's nails / the nail polish colour she selected but here's a shot of us sporting our freshly manicured nails! I truly enjoyed the process, the atmosphere was quiet and everyone was really friendly at the salon. The seats were super comfy to just lay back and chat away whilst our nails were drying off, All in all we spent about an hour and a half just getting our nails done, most of it was waiting for our nails to dry off. 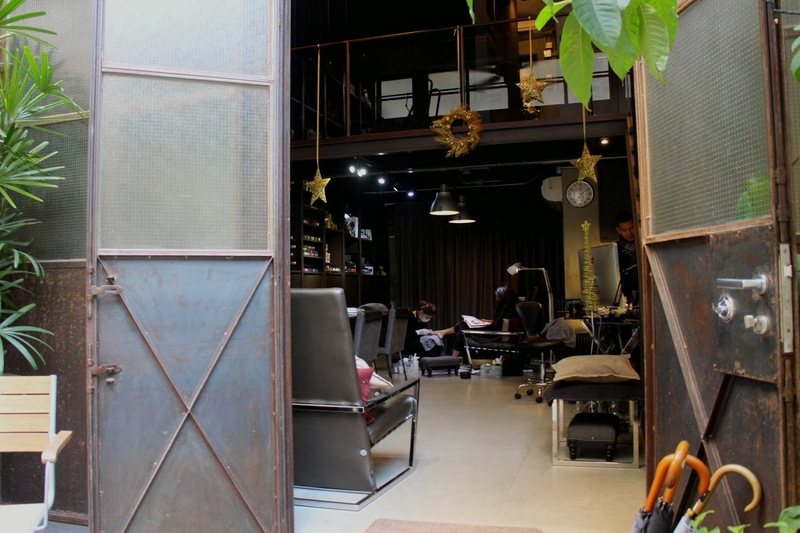 Keeping in mind that it is a deemed "premium" place to get your nails done , a regular manicure runs at around HK$250+ (est. SG$39). 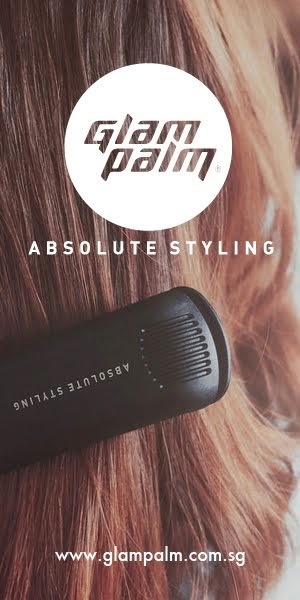 For the service I'd say its pretty worth the price, you also get to take away a buffer, nail file and a wooden cuticle pusher as well. I know a couple of nail salons that charge over HK$300 and yet you don't get the amazing service that the nail library has to offer. Ps: Sam, when you come to HK , I’m so taking you here!! I hope you lovelies enjoyed this travel post, I'm returning to SG in about a week and am super excited to be reunited with Sam very soon! 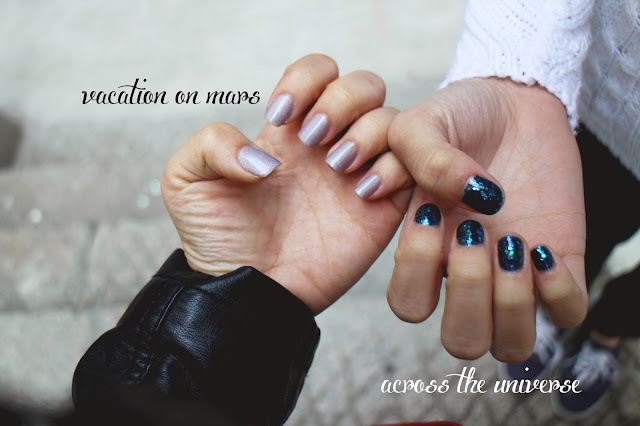 Where's your favourite place to get your nails done? Very cool idea! I love it!